Heading out on a summer holiday in the UK can be a great idea when you’ve got young children. No stressful flights or airport delays, no juggling four cases, a pushchair and the kids. But if you’re going further than an hour or so from home in the car it can soon become stressful. Getting up early to try and beat the worst of the traffic, and the amount of time you’re all actually in the car, can help as can having a bigger car to make the journey more comfortable for you all and help to prevent the backseat becoming a battlefield. 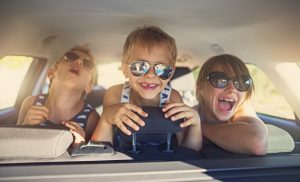 There are plenty of fun car games for long car journeys that don’t involve the words ‘I Spy’ or rely on them watching Peppa Pig on a loop on your phone until you want to scream but you can also make the journey more bearable for all of you by breaking it up with some fun stop offs. Get up early so you can try and beat the worst of the traffic and reduce the amount of time you’re actually in the car. Plan your route so that you can visit a park or two on your journey. They’re great places to have a picnic and let your little ones let off some steam outside. Take a ball and some other games so they can tire themselves out enough to sleep for some of the rest of the journey, if you’re lucky. If you’re travelling mainly by motorway, country parks are the best option. There are hundreds across the UK, from Margam Country Park just off the M4 to Pugneys near the M1. If your journey goes near the coast make sure you stop off at the beach. There are plenty of great beaches in the UK, whether you want one full of attractions such as Blackpool or Watergate Bay in Newquay, or one that’s off the beaten track, like Brancaster in Norfolk or Traeth Mawr in Glamorgan. Grab some lunch, avoiding the kids’ pester power for candyfloss and sweets, which will ramp up their energy levels, making the rest of the journey less than fun. Hunt for colourful shells and stones or look for crabs in rock pools so you get to stretch your legs too. Farms are great stop offs with children. Open farms are best for your kids as they can wander around looking at all the animals and some have petting areas. And there’s usually a farm shops where you can stock up on delicious, healthy snacks or fresh meat and vegetables for a BBQ later on. Some service stations such as Gloucester and Tebay services include a farm shop onsite, providing a great alternative to drab motorway services. Find out if your route passes any castles or stately homes and make a detour. Bolsover and Stafford Castles aren’t far from motorways, while Dover Castle is just off the A258. Make sure you check prices before you commit as some can be on the expensive side for a family of four. But many have activity sheets, mazes, adventure playgrounds and quizzes for children to make sure they really enjoy their visit. Rather than a short break in your road trip, you may need to set aside a couple of hours. If the weather is good and you’re driving on B-roads through some wonderful countryside, why not stop for a walk? Your passenger can do a quick check on their smartphone to find the best spot. Even a quick 15 minute stroll can refresh everyone and dissipate any squabbles brewing in the back seat. Look out for signs of local villages while on the motorway if you’re sick of service stations. You can turn the stop into an adventure by exploring what the village has to offer. Pack a family activity sheet for the car, a spare pair of clothes and a picnic before you head out on your journey.